Getting the correct size pump or ghillie can be difficult, as sizing does vary between brands. 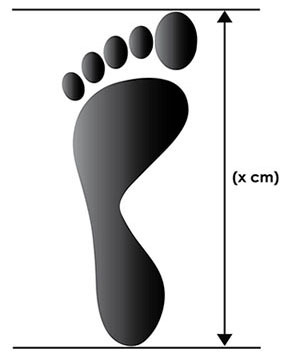 So if you are trying our shoes for the first time then you can use this guide to measure your feet and then check what size would suit you best from the size guide on the page of the dance shoe you are buying. 2. Put on the socks you normally wear when dancing and place your foot on the paper and put your heel up against the wall. (Double check that the paper is still touching the wall once you have put your foot on it just in case it has moved). 3. 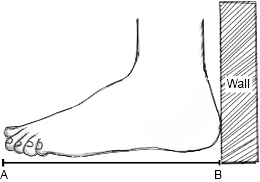 Once you are happy that both the paper and your heel are against the wall, relax your foot and toes and draw a line at the longest point of the foot (or ask a friend or family member to do this for you).